Nature's bounty is most clearly evidenced in its supply of simple needs like water, which lies under the feet awaiting our claim, and is frequently replenished from above. In contrast to those who stress and strain towards further attainment, some can accept and trust in life. This metaphor is about something that gives and gives and yet is not diminished. This is because Nature replenishes – offers recompense for – whatever is expended. Despite the countless times that people draw upon our resources, we have the capacity to remain who we always are, and to rely upon that through a certainty of being. We continually enter into exchanges with others – we always have to assimilate something of them in order to relate, and it always costs us energy. Yet despite drawing in, and giving out, not much really changes – and even on the deepest levels, we are not essentially compromised at all through these interactions. Nature replenishes us no less than it would the old well. Even the apparently solid ground beneath us is prone to suffer earthquakes – whereas the core identity of self is uncompromisingly faithful to itself. I am always me, and you are always you; ever will it be so. Sometimes what appears trite is in fact profound – and this simple organic integrity of being is such an example. Our very beingness is our most precious and important quality. The more fully we trust in our indestructability of self, the freer we are to project versions and possibilities into the world. Everything we say, do or think is an aspect of something deeper – as with transient leaves on a tree whose trunk is solid and whose roots are strong. As no leaf can ever be false, so each and every insubstantial and ephemeral personal impulse has purity as its source. In all our dealings with others – however inept they may be – we can know that we must, and always will, bounce back to re-state our basic life message. 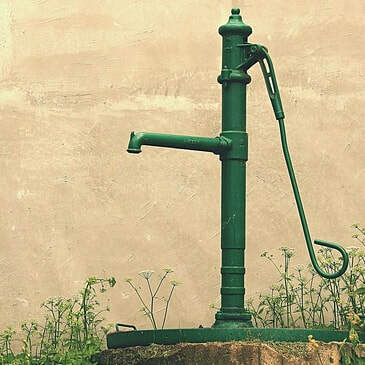 The well is an unimpeachable symbol of life – and yet so are we.